Designed as a wall map for planning tramping trips and excursions in north-west Nelson, this map shows the bulk of Kahurangi National Park and other conservation reserves between Karamea in the west, Able Tasman National Park in the east. Cape Farewell in the north, and the Mokihinui River and Mount Owen in the south. 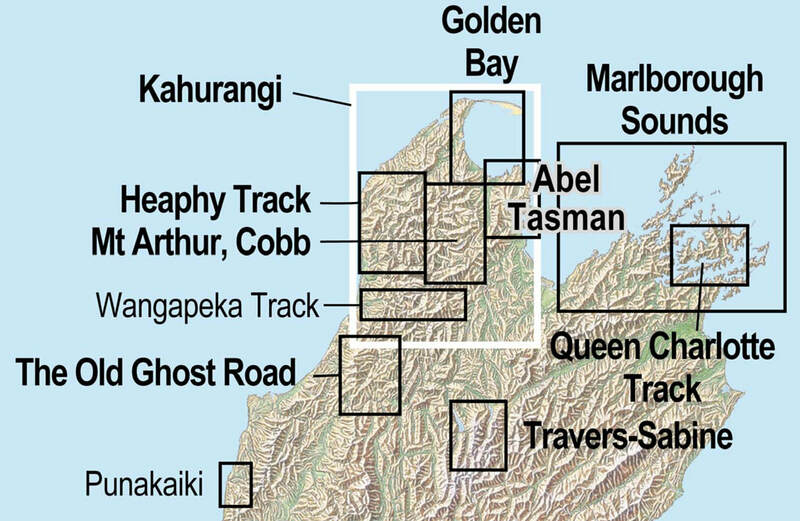 The positions of the main tramping tracks, tramping routes, and huts are prominent, as are the Abel Tasman Coast and Inland Tracks, the Heaphy Track, the Wangapeka Track, the Mount Arthur Tableland, the Cobb Valley, the Mokihinui end of the Old Ghost Road, and all the tracks in between. The boundaries of Kahurangi National Park, and other reserves, are shown in a way that does not dominate the landform. In the eastern part of the map, the route of the western part of Nelson’s Great Taste Trail is included. Flat copies of this map are available direct from NewTopo. Map $24 Tube $7. Plus postage.